Gwyeth Smith, known as Smitty, is a beloved guidance counselor who believes that getting into college should be a kid’s first great moment of self-discovery. 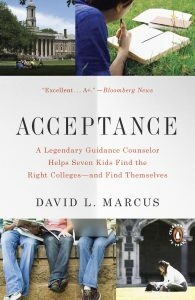 In Acceptance, David L. Marcus, Pulitzer Prize–winning former education writer for U.S. News & World Report, spins an absorbing narrative of a year in the lives of Smitty and “his” kids. At a diverse public school in Long Island, New York, Smitty works his unique magic on students’ applications and their lives, helping them find the right college by figuring out who they are, rather than focusing on test scores, grades, and finances. Loaded with advice that readers can apply to their own college searches, Acceptance is a book unlike any other about admissions. Students and their parents will find indispensable. That’s why Bloomberg News gave it an “A+” grade.